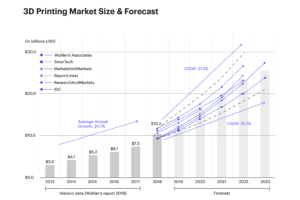 The Additive Manufacturing market is forecast to grow 18.2% to 27.2% annually between 2019 and 2023, for an average compound annual growth rate of 23.5%, according to experts cited in a March report issued by 3D Hubs. That represents a doubling of size every three years. 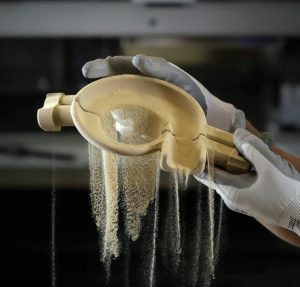 A company from Netherlands that operates an online platform for companies seeking 3D Printing, CNC machining, and injection molding services—added that investments in the additive manufacturing industry are rising rapidly too. From 2016 to 2017, venture capital funding increased 86%. In 2018, VC funding related to 3D Printing startups exceeded $300 million. • Automotive leads the development of Additive Manufacturing for production applications. Three of four major automotive companies in the U.S. and Germany now use 3D printing to mass-manufacture parts for their cars or for spare parts. Prototyping remains the primary application for 3D printing and has been universally adopted. • 3D printing services account for 37% of global revenues; materials, 15%; printers and software, 27%; and other services, 21%. • The online demand for plastic parts in 2018 was 100 times higher than for metal ones, but the value per part of the latter was, on average, 35 to 50 times higher. The report states that the biggest change to AM in 2018 was related to the perception of the technology. It’s now perceived as a viable method of manufacturing—not just a prototyping technique. The study notes that the main obstacles to broader adoption of Additive Manufacturing are that potential users don’t understand the technology and its capabilities. And, the study concludes, AM will not replace traditional manufacturing technologies like CNC machining or injection molding, but it will work alongside them to create a digital manufacturing ecosystem.